A Banggai Cardinalfish book sneak peek – the opening spread for the Appearance & Anatomy chapter, featuring artwork by project artist Karen Talbot. 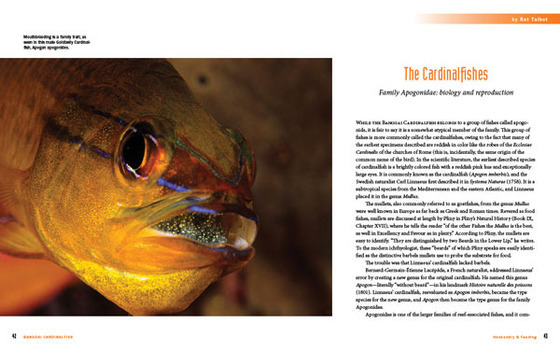 UPDATE: Printed hardcover and softeover editions of The Banggai Cardinalfish book will be introduced at the Marine Aquarium Conference of North America, Ft. Lauderdale, August 30th – September 1st, 2013. Books will be exclusively distributed by Two Little Fishies, who will have copies on hand for purchase and to present to Banggai Rescue Project Kickstarter Backers who are getting copies as part of the rewards program. Individual copies may be ordered directly from the publisher. Click to be notified when books are available to order. 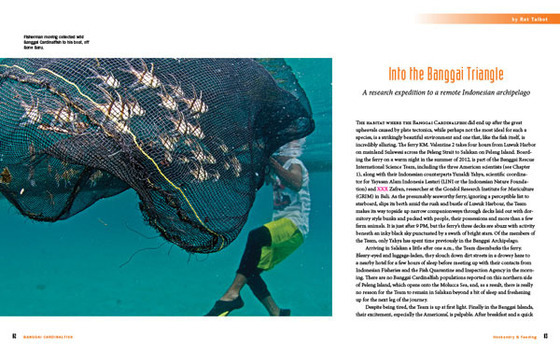 A Banggai Cardinalfish book sneak peek – Into the Banggai Triangle opening spread. 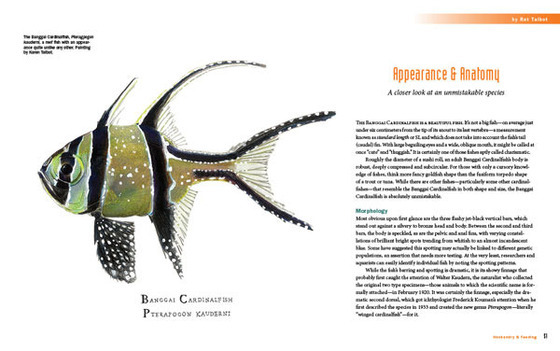 A Banggai Cardinalfish book sneak peek – opening spread for The Cardinalfishes chapter.